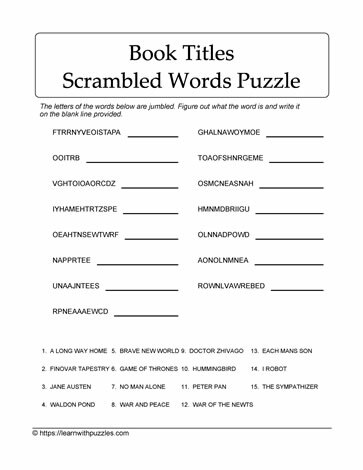 Jumbled fiction book words puzzle. Here is a scrambled words printable puzzle to engage problem solving skills and expand your and your students' fiction book titles vocabulary. To solve this printable, unscramble the letters in the list. Use the word bank at the bottom of the page as your clue. Suitable for students in high school grades 9, 10, 11, 12 and the homeschooling environment. Use the list of fiction titles as possibilities for further reading. Use in Language/English classes as an extension to current programming.